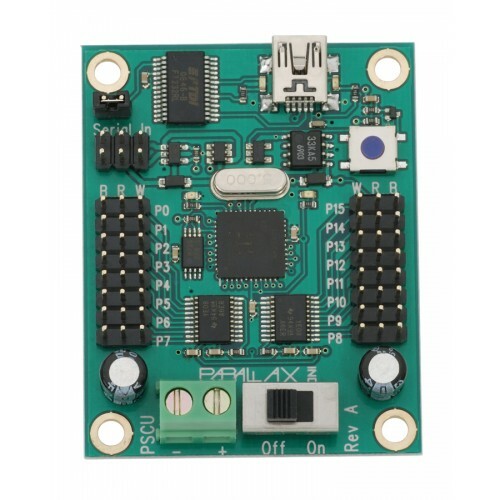 The Servo Controller allows you to control up to 16 servos (32 using two Servo Controllers) by sending serial commands from a microcontroller or PC via its USB connection. The Servo Controller USB is Propeller-based. The Servo Controller is fully compatible with the beta PSCI software application. In addition the hardware and software were set up to take advantage of additional features that you can implement in custom software. Additional features that can be taken advantage of with custom software are an additional 32K EEPROM included for storing of custom settings and/or sequence data, CMOS switch capable of controlling downstream serial communication and a software controlled LED. A great choice to use in your next custom robot project. The HSR-5498SG servo uses super strong..